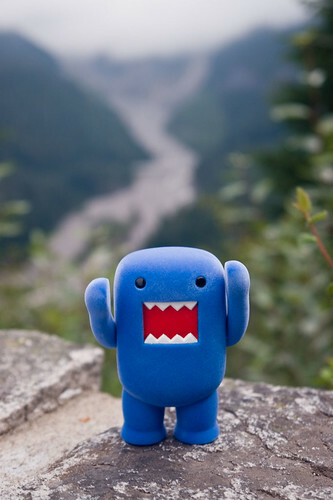 Uglyworld #733 - Domo at Nisqually River, originally uploaded by www.bazpics.com. As I'm sure you're all very well aware, Domo constantly screams about something, today he chose this great viewpoint over Nisqually River to vent his anger to the weather gods who didn't provide him with the blue sky and sunshine that he ordered in advance of this daytrip to Mount Rainier National Park. He's now seeking a refund for the money he didn't pay in the first place for this request.